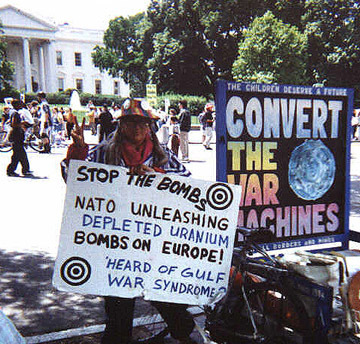 If, between November 2000 and March 2001, you looked for us, our signs had been moved across Lafayette Park to H Street to make room for President Bush's inauguration. This move has been required by the National Park Service every four years since the vigil began in June, 1981. A dozen large mobile homes are damaging the grass of the southern half of Lafayette Park for the construction crews' daytime comfort as they erect the huge bleachers for the January 20th inauguration. The bathrooms on the north side of the park are permanently locked. Construction workers always have several porta-johns for personal use. The trees where squirrels nest have been boxed in with plywood, and bleachers rise in the space where our vigil normally stands, along the north side of Pennsylvania Avenue. All so the press -- for a couple of hours one afternoon -- can stay warm and dry near bathrooms, while President Bush watches his inaugural parade. --> Go to next page for linked history of inaugurations of yore.